Gov. Rick Perry says he was just exercising his right under the state Constitution when he carried out a threat to veto millions of dollars in state funding destined for a public integrity unit overseen by a district attorney who had pleaded guilty to drunken driving. A grand jury came to a different conclusion, saying Perry crossed the line into criminal behavior when he used state funding as a carrot if the DA resigned, and then employed his veto as a stick when she didn’t. The public won’t know what Perry’s criminal prosecution will look like until there is a trial with witnesses, evidence and a full examination of the alleged violations. What might a trove of emails say? Who will testify for the prosecution? There is a lot we don't know yet. It’s Not Just the Veto: No one disputes that Perry, a Republican, had the authority to use his line-item veto power, guaranteed by the Texas Constitution, to eliminate the $7.5 million in two-year state funding for the public integrity unit. That unit, charged with prosecuting public corruption cases in the state capital, is operated by the office of Travis County District Attorney Rosemary Lehmberg, a Democrat. Nor does anyone dispute that Perry, under the First Amendment, has the unfettered right to call for the resignation of Lehmberg or any other DA. The allegation is that Perry improperly combined the two — that he illegally tied his power over integrity unit funding to his demand that Lehmberg resign, essentially setting up a quid pro quo arrangement that crossed the line into an abuse of power. Even after the veto, there were numerous reports that Perry's office continued to dangle a restoration of the state funding or a future job offer to Lehmberg if she would leave office. Sources said Lehmberg rejected the deal because she questioned whether it was legal. Asked about those reports Saturday, Perry said: “The details of my decision-making were very clear. I said early on that I was going to clearly veto those dollars as long as they had someone in that office who I had lost confidence in, and I did exactly what I said I was going to do." The Lehmberg Video is Scandalous: Perry’s strongest case going forward, at least in the court of public opinion, will probably center on Lehmberg’s outrageous conduct during and after her arrest. According to arrest reports and published accounts, a driver called 911 in April 2013 after seeing someone in a Lexus driving erratically, crossing into the bike lanes and swerving into oncoming traffic. Lehmberg, Travis County’s top law enforcement official, was later found in a church parking lot with a bottle of vodka in the front seat. The video of her field sobriety tests and from inside the Travis County Jail is scandalous and highly embarrassing: She screamed and cried, kicked a door, stuck out her tongue and repeatedly tried to pull rank by telling authorities to “call Greg” — meaning Travis County Sheriff Greg Hamilton. "Y'all are gonna be in jail, not me," she declared at one point. She ultimately had to be restrained in leg irons before her blood was drawn. Even hours after her arrest, her blood-alcohol content was found to be at nearly three times the blood-alcohol limit. She pleaded guilty and was sentenced to 45 days in jail. Perry mentioned the horrendous images documenting Lehmberg’s conduct at his news conference Saturday. “Americans and Texans who have seen this agree with me that that is not an individual who is heading up an office that we can afford to fund,” he said. 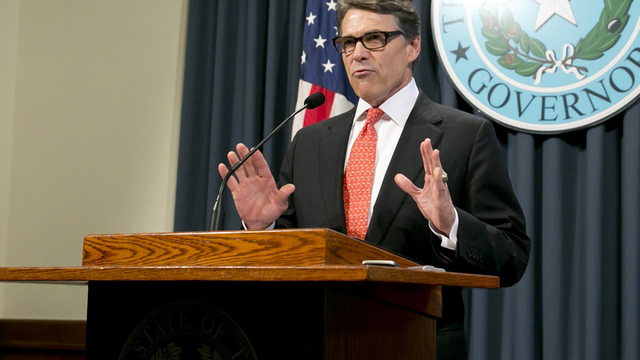 Jurors who sit in judgment of Perry might be swayed by those images, too. It Will Be Hard to Dismiss Prosecution as Partisan Witch Hunt: There is long-standing animosity between the Travis County district attorney’s office and the Republicans who rule the Texas Capitol. There have been plenty of failed attempts over the years to move the investigative power out of that office and into an agency such as the Texas attorney general’s office, which has been under Republican control for some 15 years. Naturally, Perry and his fellow Republicans are calling the indictments against Perry the result of a partisan investigation by an office controlled by Democrats — the same office that prosecuted former U.S. House Majority Leader Tom DeLay, a Republican, later acquitted on appeal. But Lehmberg and other Travis County officials recused themselves from the case and are not prosecuting it. One year ago a Republican judge from Bexar County, Bert Richardson, appointed a special prosecutor, Michael McCrum, to handle the prosecution. McCrum, a criminal defense attorney in San Antonio, is a former Dallas police officer who began his career as a federal prosecutor during the George H.W. Bush administration, according to his online bio. In 2009, the state's two Republican U.S. senators, John Cornyn and Kay Bailey Hutchison, recommended him to become U.S. attorney for the Western District, according to published reports. He was described as a “consensus choice” by the news site Main Justice because he had the backing of House Democrats and the two home state senators. He ultimately withdrew his name because of gridlock over nominations on Capitol Hill. McCrum’s bipartisan credentials makes criticizing the investigation as a partisan witch hunt a tougher sell. Prosecuting Public Corruption is Easier Said Than Done: The old adage is prosecutors have so much sway they can “indict a ham sandwich.” Getting a conviction is another story. The charges in this case are abuse of official capacity, a first-degree felony, and coercion of a public servant, a third-degree felony. For the first count, the statute requires that prosecutors show Perry “intentionally or knowingly” abused his office and that he acted with “intent to harm,” both relatively high bars. Democrats suggest Perry had an ulterior motive — namely, to stop the public integrity unit’s inquiry into state cancer grants amid allegations that some were being improperly awarded to his donors. “I wholeheartedly and unequivocally stand behind my veto, and will continue to defend this lawful action of my executive authority as governor,” he said. This is Terrible Timing for Perry: Perry, the longest-serving governor in Texas history, was considered all but washed up after his once promising presidential campaign imploded on a presidential debate stage, when he couldn't remember that third federal department he wanted to shutter. But Perry was making a methodical comeback, with positive reviews in the media, a new chief strategist and a border crisis that seemed tailor-made for a Texas governor who had turned off conservatives in 2011 with his embrace of college tuition breaks for certain undocumented immigrants. His 2016 star was rising. Now he has a big distraction. Yes, fellow Republicans — including Ted Cruz and Bobby Jindal — have rushed to his defense. Yes, Perry can use the controversy to criticize Democrats for partisan overreach and possibly even raise money. But next week, Perry is expected to turn himself in at the Travis County courthouse, have his mug shot taken and get fingerprinted. Meanwhile, Texas taxpayers are picking up the cost of his $450-an-hour lawyer, leaving him open to criticism as the bills keep rolling in. And Democrats are already using the indictment to tar Perry and other potential GOP presidential hopefuls with legal woes, namely New Jersey Chris Christie, embroiled in Bridgegate, and Wisconsin Gov. Scott Walker, who is facing questions about his campaign finance activities. "I guess the requirement now to be a Republican presidential contender is either an indictment or a pending indictment," said Will Hailer, executive director of the Texas Democratic Party. Perry has plenty of answers to explain his actions, but what he really needs is to put this behind him way before any voting takes place in the 2016 race, assuming he joins it. As they say in politics, when you're explaining, you're losing.